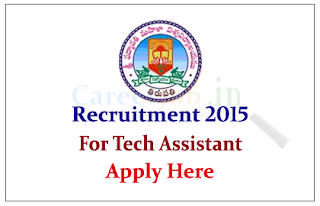 Sri Padmavatimahila Visvavidyalayam Tirupathi is recruiting for the post of Academic Consultant and Technical Assistant. Interested and Eligible candidate can attend the direct walk in interview from 9th July to 15th July 2015. Company Profile: Sri Padmavati Mahila Visvavidyalayam (University for Women)was founded in the year 1983 by Sri N.T.Rama Rao, the then Chief Minister of Andhra Pradesh, with the fervent desire to train women students as better builders of the Nation and to inculcate skills of leadership in all aspects of life.The University was established under the Sri Padmavati Mahila Visvavidyalayam Act of 1983,which has come into force on the 14 of April 1983.It was started with ten faculties and 300 students and twenty staff members. Today the University has a student population of 2700 and an academic staff 250. This year the University is going to have 59 courses at the post-graduate and undergraduate level and a good component of research. How to Apply: Interested and eligible candidate can attend the direct walk in interview on below mentioned date. For more details kindly check official notification.